In honor of Equal Pay Day, IWPR intern Lauren Hepler observes the impact of the gender wage gap as she looks to start a career after college. In this economy, it is very scary to be a college student getting ready to graduate in just one short year. And with media profits tanking, it is even more daunting to be a journalism major set to graduate in 2012. Sadly, it is worse to be a female journalism student set to graduate knowing that women still only make an average of 77 percent of men’s yearly salaries (according to median yearly earnings in 2009). Family friends of college grads, professors, and anyone who knows one—or follows one on Facebook— are curious about where we will land our first real jobs. With unemployment among people age 20-24 at 15.4 percent and showing no signs of easing, I would imagine that many other college students share my unsentimental notions on the issue. I will work wherever I can get a job. This anxiety about finding any job at all often obscures the reality that we are still confronted with: Women make only make 77 percent of men’s median yearly salaries. For a student used to living on a shoestring budget, the potential financial impact of the gender wage gap is daunting. On average, monetary losses due to the wage gap over a lifetime add up to $700,000 for a high school graduate, $1.2 million for a college graduate, and $2 million for a professional school graduate. That is not chump change. That is money that could be spent paying back overwhelming student loans, financing homes or generally saving for the future—all things young people are constantly told to do but often can’t because of budget constraints. Unfortunately, it appears this cash will not be materializing anytime soon. According to new IWPR research, if progress continues at the current rate, it will be 45 more years (or the year 2056) when men’s and women’s wages finally balance out. In fact, one of the most alarming facts about the gender wage gap is that the rate of progress is actually slowing down (despite a small gain in the number of women in management positions). 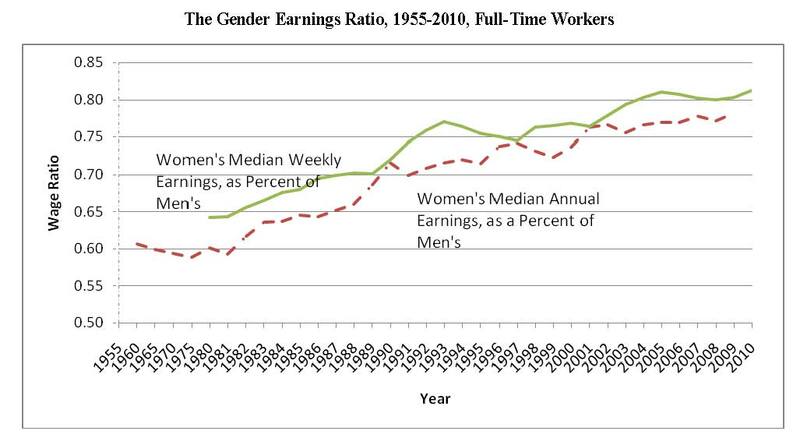 From 1980 to 1993, the gender wage gap narrowed by 12.9 percent. But in the 16 years from 1993 to 2009 the gap narrowed a meager 3.1 percent. College history classes often hark back to the 1960s as the tipping point for gender discrimination, praising the shattering of the glass ceiling for women in the workforce. Now, half a century later, how far have we really come? In 1960, women, on average, earned only 60 percent of men’s wages for a year of full-time work. In 2009 that number had risen to 77 percent, with women still making almost a quarter less than their male counterparts. And that’s just the national average. The numbers are even more jarring when comparing state-to-state, or across racial and ethnic categories. In Wyoming, for instance, women still make just 64 percent of what men earn in a year. West Virginia and Louisiana are only slightly better, at 67 percent, which is roughly equivalent to the national average in the late 1980s. As a percentage of white men’s yearly earnings Asian women average 82.3 percent, while white women average 75 percent, black women 61.9 percent, and Hispanic women just 52.9 percent of what a man earns. Despite the bleak outlook for the immediate future, actions are being pursued to correct the imbalance in the gender wage gap, with the Supreme Court last week hearing arguments on the Dukes v. Wal-Mart gender discrimination case. And there is a need for urgency on the issue. A report by the American Association of University Women (AAUW) Educational Foundation shows that the gender wage gap starts early in a career and then widens dramatically. Just one year out of college, female graduates on average make only 80 percent of their male counterparts’ salaries. Ten years down the road, the report found that the gap widened, with women receiving just 69 percent of men’s earnings by that point in their careers. This phenomenon is even more counterintuitive considering that in the last decade women have consistently outnumbered men at American colleges, with women averaging about 57 percent of enrollment. Despite making huge gains in education and being better prepared than ever to enter the workforce, complacency on the gender wage gap continues to hamper the careers of American women. As a student preparing to go on the job hunt, I know I am not exempt from this problem. However, I certainly don’t want to wait until I reach retirement age (I will be 66 in the year 2056) to get the same pay as men in my field. 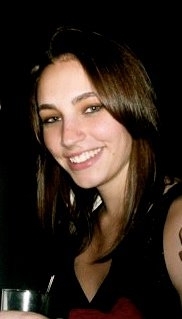 Lauren Hepler is the Communications Intern at the Institute for Women’s Policy Research. She is majoring in journalism and women’s studies at George Washington University.